We are engaged in offering an extensive range of Charger & Base Plates in the market. The entire range is manufactured from finest grade raw material and advanced technology. We are offering these products in wood and glasses. During the manufacturing of each product is checked properly to prevent any manufacturing defects. 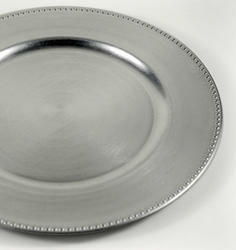 Riding on vast volumes of expertise in this arena, we are occupied in offering Metal Charger Plates. Being a customer oriented enterprise, we are engaged in providing a wide array of Hammered Steel Plate. We are one the leading Manufacturer and Exporter of Service Charger Plate . These decorative charges are ideal for dinner tables at parties, weddings and special events. 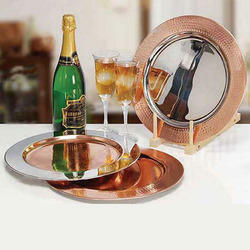 Iron Metal Designer Charger Plate, Size: 13"
We are manufacturers and Suppliers of Charger Plates in Brass and Copper material. All these are Food Safe and High Graded Products.